Directions: From the Lynchburg Expressway, continue on Boonsboro Rd (501S) & turn right on Bonton Rd. at James River Day School, turn left on Wedgewood Rd. You can also come from Rivermont Av. which becomes Boonsboro Rd. after passing Link Rd. Watch for signs! Please park carefully & do not block driveways in this residential area. Large lot very nice costume jewelry, fine jewelry including David Yurmin, Tiffany, silver and turquoise jewelry, several 14k gold rings with gemstones, Jade necklace, 14k gold earrings, and much more. 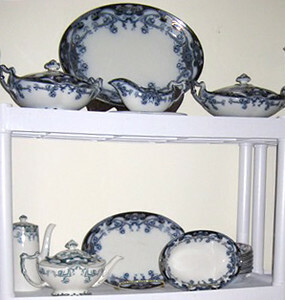 Very large lot of blue decorative china including antique flow blue, Vietri and other collectible potteries, Blue onion/Blue Danube china, numerous items of cut glass including antique, Tiffany glass sweet meat tree, and much more. Huge lot of great Christmas decorations, including trees, wreaths, ornaments, lights, and much more; table linens from fun to fine, gardening tools, large lot of cookbooks, Lynchburg Foundry iron bank in box, books, CDs, DVDs, tapes, large 20c hooked rug, lawn decorations, lots of stained glass, and much more.